Bestselling author and influential advertising expert Jean Kilbourne examines the ever-evolving marketing and sales strategies of the alcohol and tobacco industries. Kilbourne takes a close look at how both industries have re-tooled their strategies in the face of rising public health concerns, showing how ad executives continue to mobilize a highly sophisticated understanding of gendered identity -- and the psychology of addiction -- to override rational resistance to what they're selling. 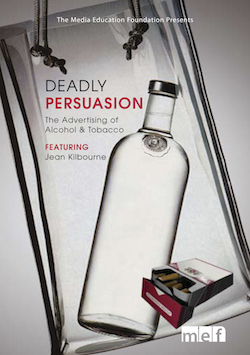 With its close analysis of a wide sampling of cigarette and alcohol ads, Deadly Persuasion is as much a case study in media literacy as it is a public health tool. Jean Kilbourne is internationally recognized for her pioneering work on alcohol and tobacco advertising and the image of women in advertising. Her films, slide lectures and television appearances have been seen by millions of people throughout the world. She was named by The New York Times Magazine as one of the three most popular speakers on college campuses today. "This video is an excellent tool for educating students how to fight back against the corporate world of alcohol and tobacco advertising." "Once again, Jean Kilbourne effectively summarizes the assault by the tobacco and alcohol industry on young people and other vulnerable populations... Deadly Persuasion offers a powerful and concise look at the impact of advertising on the abuse of the two deadliest drugs. Kilbourne not only outlines the problem, but offers concrete solutions to addressing this attack as well." "As expected, Jean Kilbourne delivers a powerful critique of how the alcohol and tobacco industries market their products to youth and college students. An excellent educational tool for the university setting." "The information on tobacco and alcohol abuse is presented in a clear manner that can be understood by people who have only a small amount of knowledge concerning these issues. The graphics and commercial clips used really drive home the message of how well these products are marketed."